Basic Information on how to correctly activate Outlook Add-In can be found here. Quick Paths – what are they? Quick Paths are a simple mechanism designed to make handling workflow elements easier for Outlook Add-In users. Quick Path is a new term introduced in version 8.2, it will be used mostly for cases where we have to accept/verify (Approval Step) elements to which we are assigned, i.e. elements where we are assigned to a Task. This article describes how to correctly configure these Paths and how to use them from the Outlook Add-In interface. In order to be able to use Quick Paths, the process must be available for MS Outlook Add-In. 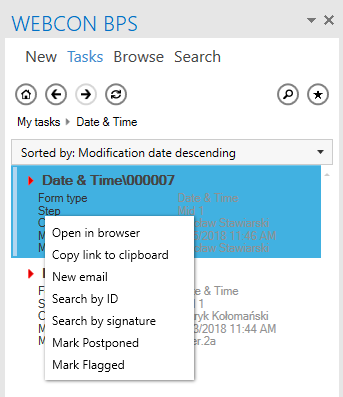 This is done in BPS Designer Studio, so go to the General process configuration tab (click on a process), move to “User privileges” tab and mark the “Available via WEBCON BPS for Microsoft Outlook Add-In” checkbox in the bottom right corner. Saving the process is the first step to success! The second (and essentially the last) step is to decide which Path will be made available in Outlook Add-In. Before you decide which Path to speed up, it might be wise to ask oneself – what makes a Path fast? Intuition and experience suggest, that the fastest Paths are those that don’t require any of the element’s Form fields to be modified – like accepting a delegation date, approving an employee’s vacation, or confirming the requisition of merchandise/a package. Configuring the workflow Path to allow integration with Outlook Add-In is as simple as applying the same privileges for a process. To correctly configure a given Path we must find it in BPS Designer Studio: Go to the desired process, click Workflows, then double click (or select and click the edit button) the Step from the Path starts. This should bring up the Step edit screen listing all Paths leading from this step. Marking the appropriate checkbox and saving the process practically concludes the configuration. 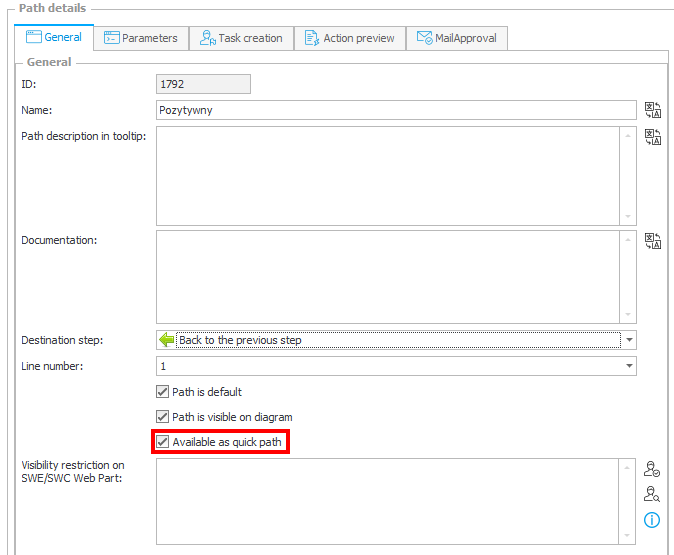 Of course, correctly configuring task assignment and task execution on paths etc. is also necessary for Quick Paths to function correctly. Quick Paths allow the user to move the workflow element to the next Step from Outlook Add-In – all other functions associated with the Path (Actions etc.) are carried out normally. Verifying whether Quick Path works as intended is done in MS Outlook. Launch MS Outlook with the BPS Add-In installed. Find the desired element and click the right mouse button. Apart from the standard options, the drop-down menu should now also feature available Paths, which can be taken from the Step the workflow element is currently in. Selecting the Path has exactly the same effect as selecting it in your web browser. This is especially important when it comes to “negative” Paths (Return, Reject etc.) wher in most cases the workflow is configured so that the user has to justify taking that Path. At the moment, Outlook Add-In does not have the ability to edit the system comment which would allow for a much broader range of uses. As you can see, configuring Quick Paths is one of the easier things you can do in BPS. Nonetheless, my experience in implementation dictates, that it’s the small things that enjoy the most popularity. If something is simple and works, why not use it?